10.5.1. Why is the hypervisor status red? 10.5.2. I have subscription status errors, what do I do? 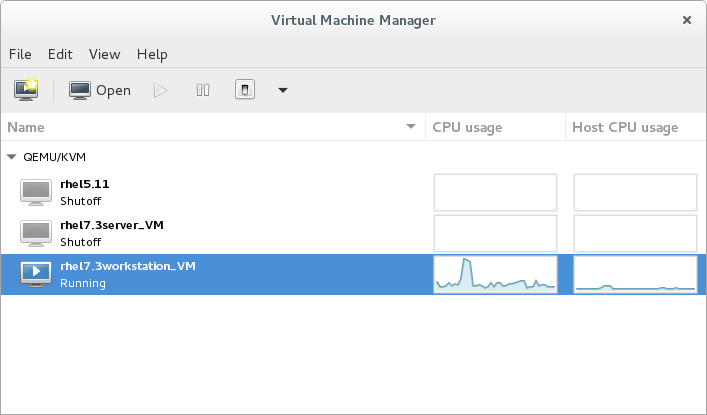 The Virtual Machine Manager, also known as virt-manager, is a graphical tool for creating and managing guest virtual machines. 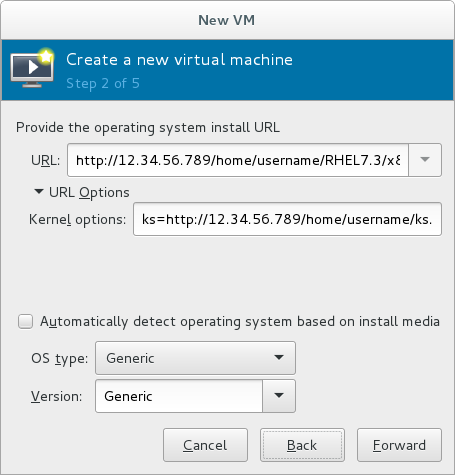 This section covers how to install a Red Hat Enterprise Linux 7 guest virtual machine on a Red Hat Enterprise Linux 7 host using virt-manager. These procedures assume that the KVM hypervisor and all other required packages are installed and the host is configured for virtualization. For more information on installing the virtualization packages, see Chapter 2, Installing the Virtualization Packages. Ensure that virt-manager can access the installation media (whether locally or over the network) before you continue. This procedure covers creating a Red Hat Enterprise Linux 7 guest virtual machine with a locally stored installation DVD or DVD image. Red Hat Enterprise Linux 7 DVD images are available from the Red Hat Customer Portal. 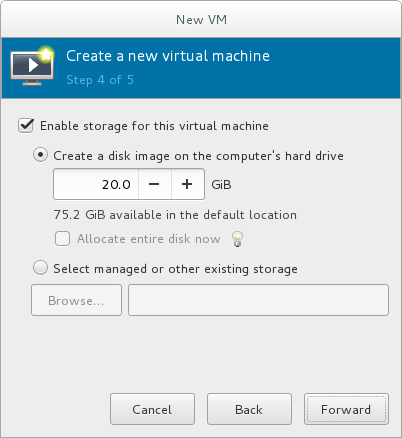 Prepare the storage environment for the virtual machine. For more information on preparing storage, see Chapter 13, Managing Storage for Virtual Machines. 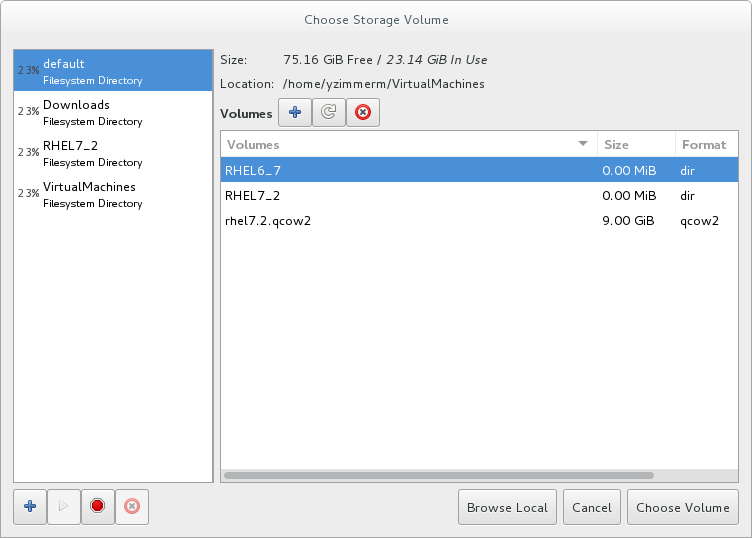 Various storage types may be used for storing guest virtual machines. However, for a virtual machine to be able to use migration features, the virtual machine must be created on networked storage. 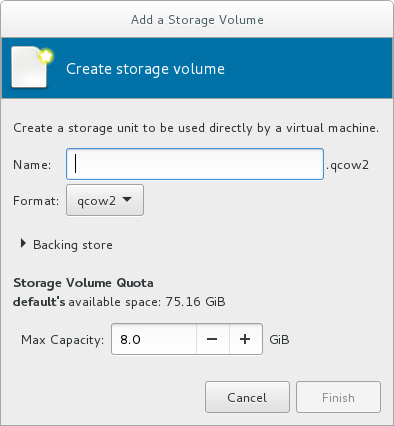 Red Hat Enterprise Linux 7 requires at least 1 GB of storage space. However, Red Hat recommends at least 5 GB of storage space for a Red Hat Enterprise Linux 7 installation and for the procedures in this guide. Open virt-manager by executing the virt-manager command as root or opening Applications → System Tools → Virtual Machine Manager. Optionally, open a remote hypervisor by selecting the hypervisor and clicking the Connect button. Click to start the new virtualized guest wizard. The New VM window opens. This method uses a CD-ROM, DVD, or image of an installation disk (for example, .iso). This method involves the use of a mirrored Red Hat Enterprise Linux or Fedora installation tree to install a guest. The installation tree must be accessible through either HTTP, FTP, or NFS. If you select Network Install, provide the installation URL and also Kernel options, if required. This method uses a Preboot eXecution Environment (PXE) server to install the guest virtual machine. Setting up a PXE server is covered in the Red Hat Enterprise Linux 7 Installation Guide. To install using network boot, the guest must have a routable IP address or shared network device. If you select Network Boot, continue to STEP 5. After all steps are completed, a DHCP request is sent and if a valid PXE server is found the guest virtual machine's installation processes will start. 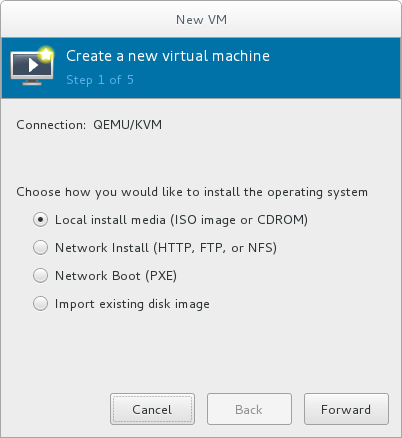 This method allows you to create a new guest virtual machine and import a disk image (containing a pre-installed, bootable operating system) to it. If you selected Local install media (ISO image or CDROM), specify your intended local installation media. If you wish to install from a CD-ROM or DVD, select the Use CDROM or DVD radio button, and select the appropriate disk drive from the drop-down list of drives available. If you wish to install from an ISO image, select Use ISO image, and then click the Browse... button to open the Locate media volume window. Select the installation image you wish to use, and click Choose Volume. If no images are displayed in the Locate media volume window, click the Browse Local button to browse the host machine for the installation image or DVD drive containing the installation disk. 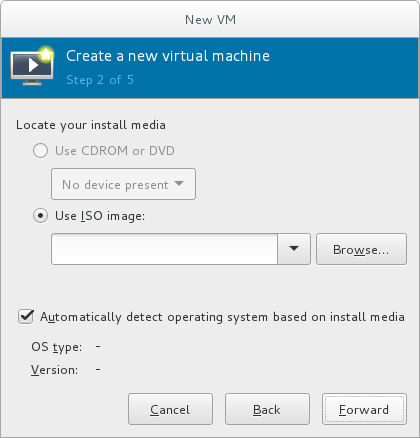 Select the installation image or DVD drive containing the installation disk and click Open; the volume is selected for use and you are returned to the Create a new virtual machine wizard. For ISO image files and guest storage images, the recommended location to use is /var/lib/libvirt/images/. Any other location may require additional configuration by SELinux. See the Red Hat Enterprise Linux Virtualization Security Guide or the Red Hat Enterprise Linux SELinux User's and Administrator's Guide for more details on configuring SELinux. If you selected Network Install, input the URL of the installation source and also the required Kernel options, if any. The URL must point to the root directory of an installation tree, which must be accessible through either HTTP, FTP, or NFS. For a complete list of kernel options, see the Red Hat Enterprise Linux 7 Installation Guide. Next, configure the OS type and Version of the installation. Ensure that you select the appropriate operating system type for your virtual machine. This can be specified manually or by selecting the Automatically detect operating system based on install media check box. Specify the number of CPUs and amount of memory (RAM) to allocate to the virtual machine. The wizard shows the number of CPUs and amount of memory you can allocate; these values affect the host's and guest's performance. Virtual machines require sufficient physical memory (RAM) to run efficiently and effectively. Red Hat supports a minimum of 512MB of RAM for a virtual machine. Red Hat recommends at least 1024MB of RAM for each logical core. Assign sufficient virtual CPUs for the virtual machine. If the virtual machine runs a multi-threaded application, assign the number of virtual CPUs the guest virtual machine will require to run efficiently. You cannot assign more virtual CPUs than there are physical processors (or hyper-threads) available on the host system. The number of virtual CPUs available is noted in the Up to X available field. After you have configured the memory and CPU settings, click Forward to continue. Memory and virtual CPUs can be overcommitted. For more information on overcommitting, see Chapter 7, Overcommitting with KVM. Enable and assign sufficient space for your virtual machine and any applications it requires. Assign at least 5 GB for a desktop installation or at least 1 GB for a minimal installation. Live and offline migrations require virtual machines to be installed on shared network storage. For information on setting up shared storage for virtual machines, see Section 15.4, “Shared Storage Example: NFS for a Simple Migration”. Select the Create a disk image on the computer's hard drive radio button to create a file-based image in the default storage pool, the /var/lib/libvirt/images/ directory. Enter the size of the disk image to be created. If the Allocate entire disk now check box is selected, a disk image of the size specified will be created immediately. If not, the disk image will grow as it becomes filled. qcow2 and host file systems keep their own metadata and scalability should be evaluated/tuned when trying very large image sizes. Using raw disks means fewer layers that could affect scalability or max size. Click Forward to create a disk image on the local hard drive. Alternatively, select Select managed or other existing storage, then select Browse to configure managed storage. If you select Select managed or other existing storage to use a storage pool, click Browse to open the Locate or create storage volume window. Select a storage pool from the Storage Pools list. Optional: Click to create a new storage volume. The Add a Storage Volume screen will appear. Enter the name of the new storage volume. Select the new volume and click Choose volume. Next, click Finish to return to the New VM wizard. Click Forward to continue. Name the virtual machine. Virtual machine names can contain letters, numbers and the following characters: underscores (_), periods (. ), and hyphens (-). Virtual machine names must be unique for migration and cannot consist only of numbers. By default, the virtual machine will be created with network address translation (NAT) for a network called 'default' . To change the network selection, click Network selection and select a host device and source mode. Verify the settings of the virtual machine and click Finish when you are satisfied; this will create the virtual machine with specified networking settings, virtualization type, and architecture. Or, to further configure the virtual machine's hardware, check the Customize configuration before install check box to change the guest's storage or network devices, to use the paravirtualized (virtio) drivers or to add additional devices. 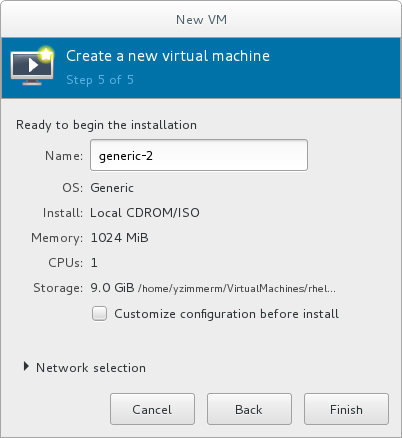 This opens another wizard that will allow you to add, remove, and configure the virtual machine's hardware settings. Red Hat Enterprise Linux 4 or Red Hat Enterprise Linux 5 guest virtual machines cannot be installed using graphical mode. As such, you must select "Cirrus" instead of "QXL" as a video card. After configuring the virtual machine's hardware, click Apply. 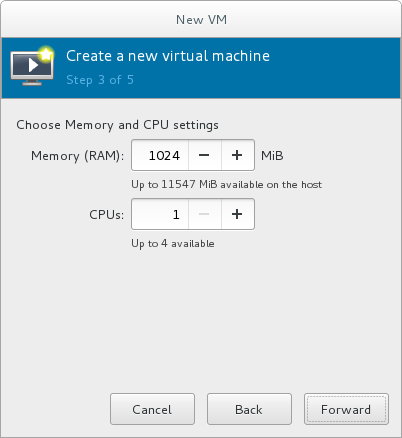 virt-manager will then create the virtual machine with your specified hardware settings. When installing a Red Hat Enterprise Linux 7 guest virtual machine from a remote medium but without a configured TCP/IP connection, the installation fails. However, when installing a guest virtual machine of Red Hat Enterprise Linux 5 or 6 in such circumstances, the installer opens a "Configure TCP/IP" interface. For further information about this difference, see the related knowledgebase article. Click Finish to continue into the Red Hat Enterprise Linux installation sequence. For more information on installing Red Hat Enterprise Linux 7, see the Red Hat Enterprise Linux 7 Installation Guide. A Red Hat Enterprise Linux 7 guest virtual machine is now created from an ISO installation disk image.